dress code, which includes no sneakers, jeans, or inappropriate dress or head attire. greet the Laois members on West 48th St. We look forward to meeting the Minister again. documenting a bottom-to-top ascent of Mount Everest. fiddle in his own band on special occasions, including St. Patrick’s Day evening. already received a number of excellent reviews. Thursday, April 11, at 7 p.m. at the Freeport Memorial Library, 144 W. Merrick Rd., Freeport. 2019 Scholarship Contest: The St. Patrick’s Day Parade offers scholarships to high school and college students. You can see all of the rules and get the application on the Parade website,www.nycstpatricksparade.org. Click on “About Us” at the top. Then click on “2019 Scholarship Contest” for the application guidelines. Deadline is April 1st. NYC St. Patrick’s Day Parade website: www.nycstpatricksparade.org. Note: Thanks to Patricia Phelan for her help in editing this press release. Mike Dunphy, President, (973) 886-6097, mike.dunphy@att.net. Please send us your email address to facilitate sending our press releases and notifications. 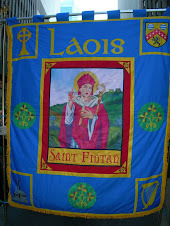 Assembly Time: Our County Laois unit will assembly this year near No. 48, on 48th Street, between 5th and 6th Avenues. We will march ahead of County Carlow and follow County Wicklow. Please remember that this year the Parade is on Saturday March 16. Our regular Press Release for the 2019 parade will be posted here within a few days.